Here we have a beer that is a perfect fit for me and my site. This beer label just screams “BeerMetalDude!” After looking up info on Snoqualmie Falls Brewery, I did not see any info on this beer listed on their site, but after looking at their other offerings, this one really seems out of place. Their year round beers include P.G.A. (Perfectly Great Amber) Amber, Haystack Hefeweizen, Copperhead Pale Ale, Wildcat IPA among other not so evil names and labels. According to the notes on Ratebeer.com, it says that the Devil is in the details, and that the Baphomet is the 15th card in the Tarot deck. This beer was supposed to be released as Snoqualmie Falls Brewing Company’s 15th year anniversary, but for some reason the beer was not released that year. They really wanted to released this beer, as they said “The beer and the eye-grabbing label were just too good not to release.” This beer became their 15th+1 anniversary release. I am very lucky to have a friend like Jorge Espinoza of the awesome craft beer and anime pairing website, animebeers.com, and man behind Nubis Sanctum Ales. Speaking of labels, let’s dive right into this amazing label for this beer. The main color of the label is similar to that of the Green Aventurine stone with an arched window drawn on front displaying a depiction of the devil in Baphomet form. The image of the Baphomet as the Sabbatic Goat, as we all know was drawn by French occult author and ceremonial magician, Eliphas Levi in 1856. This image was used on this label with few minor changes. The most noticeable change is the placement of a pint glass of beer in his raised left hand. I, of course fell in love with this beer label dawning the winged humanoid goat with breasts upon first gaze. I am usually intrigued by the occult and the like. I was hoping that the beer would live up to the amazing label. After having this beer, I believe that it did. Read on to see my thoughts on Baphomet. I used a Real Ale Brewing Company Devil’s Backbone chalice glass for this session. Appropriate glassware, if I must say so. Baphomet poured a thick cloudy reddish-brown color that was topped with a half inch dark tan foamy head. There was very good head retention and it stuck around for quite some time leaving excellent thick soapy lacing down the glass. The aroma was heavy with caramel malt, up front followed by a nose of sweet brown sugar/molasses. There were light hints of raisins, and plums. I found a mild aroma of earthy hops in there. The nose finish was nutty and caramel, real candy like. The taste was very similar to the nose, just more pronounced. Big flavor of caramel and toffee hit the palate first. Baphomet had a bold, yet sweet body of raisins, plums, bready biscuit and brown sugar/molasses. A bit more of the hop profile was picked up in the taste with grassy and earthy notes, with a slight hint of grapefruit. There were mild notes of hazelnut, and wood. Good complex flavor. The aftertaste was a mixture of nuts, caramel, sweet brown sugar, and caramel. Just like the nose, it was very candy-like. Baphomet had a heavy body with an excellent sweet, slick and sticky mouthfeel. The finish was slick and mouth coating with a slight sweetness lingering on the lips after each sip. Overall, I really enjoyed this beer. It was a damn near perfect beer, in my opinion. I will admit that I was a bit scared at first. I wasn’t sure that this beer would live up to my expectations after seeing the label. 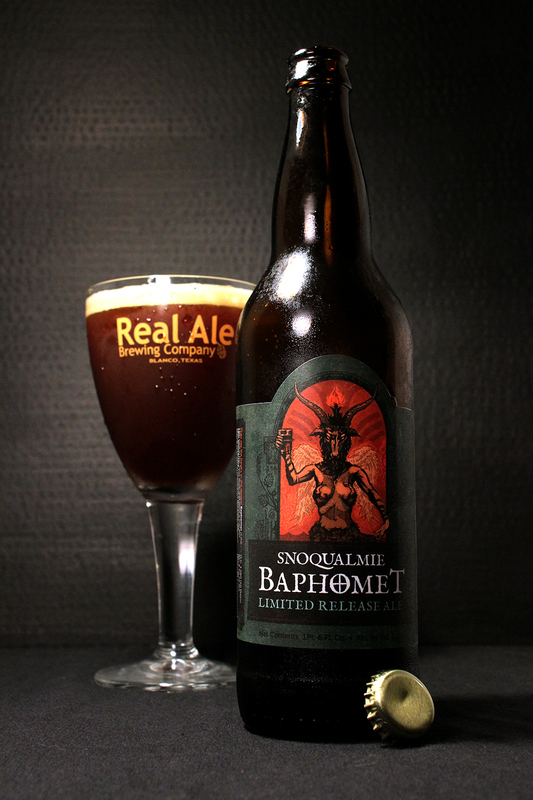 I am glad the fine folks over at Snoqualmie Falls Brewing Company were able to brew and release such a fine example of a true evil beer. The devil will be happy by this! Hails! Metal Connection: One song came to mind after seeing this bottle, and the beer name. 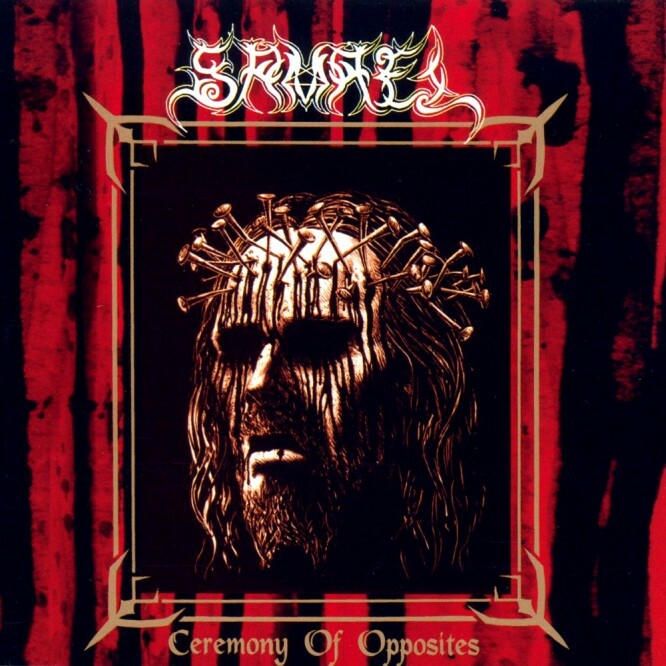 in 1994, Switzerland’s Samael released a truly iconic album with Ceremony of Opposites. On this album there was a little number called Baphomet’s Throne. This song really helped Samael become a known name in the Metal scene. There was a music video for this song which was aired on Mtv’s Headbanger’s Ball video show. Yes, this channel actually used to show music videos, and Metal ones, at that. For this album, Samael toured the US as opening band for, I believe Cannibal Corpse. I was able to attend this show at my young age, as I was still in High School in 1994. Samael is one of those bands that started out as a full assault Black Metal band in 1987 with Satanic lyrics and imagery playing a huge part in their early career. Ceremony of Opposites was the band’s 3rd full length album, and this album started to show signs of them leading towards an industrial style with the additions of keyboards, drum programming and samples. The band is now a full on Electronic/Industrial band, and even their lyrical themes have changed to be more about outer space, discovery, political, spirituality, and a bit anti-religion still at times. I admit that I do not like Samael as much as I once did back in the mid 90’s, but I will always relive their first 3 albums from time to time.